Prime Minister LEE KUAN YEW spent his life carving a nation, Singapore, together with its incredible success story. This achievement is striking by any global standard but especially so when seen with Arab eyes, contrasted and compared against the systemic failures of Arab leaders to build a successful, democratic, and stable society over the same period as PM LKY’s career. 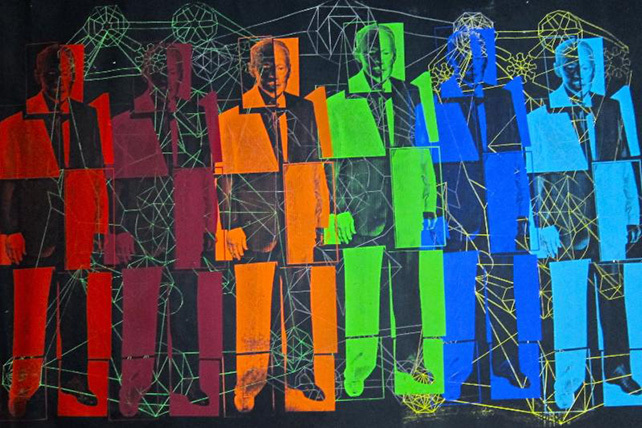 In 2010, Lebanese artist Laudi Abilama commenced a series of artworks that portrayed the most prominent leaders of the Middle East. 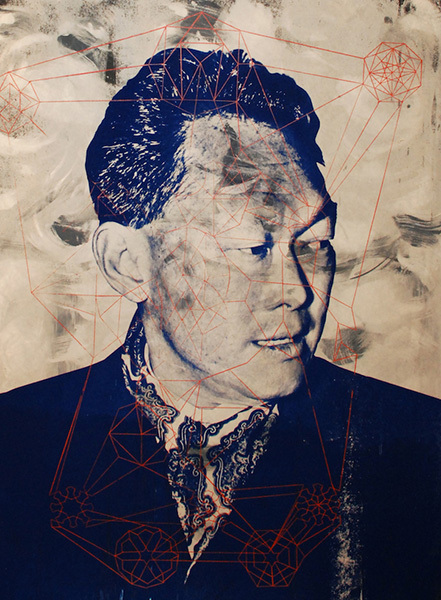 Following an artists residence in Singapore in 2011, she was inspired to continue her leaders’ portraits by focusing on Prime Minister LEE KUAN YEW. Abilama’s Prime Minister LEE KUAN YEW series is an artistic commentary on how PM LKY worked closely within a multicultural society, embracing the colourful makeup of Singapore and its people’s potential to the fullest. Abilama uses a screen printing technique (a stencil method of print making in which a design is imposed) on paper and linen, with blank areas coated with an impermeable substance. She mixes her own pigment and forces it into the mesh openings by the fill blade or squeegee and onto the printing surface during the squeegee stroke, printing one colour at a time, which makes each piece unique. Integrated into her images of the Prime Minister LEE KUAN YEW are spontaneous, un-calculated traces of Islamic geometric forms, created much in the same way they were hundreds of years ago. Each circle is drawn at random and the lines that emerge from them determine the continuation of the composition. There is no set start or end point for each line, but rather a link between them and a silent potential for forms and compositions to emerge, in much the same way as PM LKY steered his nation to prosperity. Abilama’s portraits of Prime Minister LEE KUAN YEW equally probe and celebrate the life of a man with conviction who crafted an incredibly successful vision for his country.